MOBA stands for Multi-player Online Battle Arena and is one of the latest and most popular genres of online games. Like World of Warcraft in MMORPGs, MOBAs have a strong overpowering leader that almost symbolizes the whole genre on League of Legends. LoL alone represents a large part of the excitement for this style of gaming. 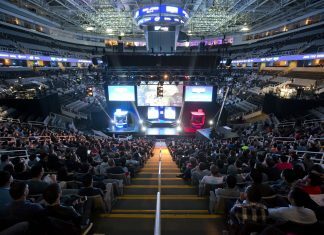 However, other games are getting a boost also because of the natural appeal of e-sports for this industry. Players are constantly competing against each other in tournaments and ladders. In fact, GameOgre has had several of both. MOBA Games Forum – One of the most popular forums on GameOgre. Not surprisingly, LoL is the top subject here. League of Legends North American Riot Points Card – Undoubtedly, the most popular item currently in our Game Shop. You buy it by being an active member of the forum or blog since you will accumulate Ogre Points or Ogre Dollars by doing so. Champion Versus Forum – The best place to discuss individual champions. MOBA Games Trivia – Test your knowledge against other players with LoL being the main topic. GameOgre LoL Tournament – Latest tournament where GameOgre.com forum members compete against each other to determine who will win prizes and a medal. League of Legends – The current king of the genre. Smite – One of the secondary leaders that has been played by GameOgre for Ogre GameTime. Defense of the Ancients – DotA started as an offshoot of RTS games. Defense of the Ancients 2 – DotA 2 is the sequel that continues the success of the original, but still trails LoL in terms of popularity. Awesomenauts – 2D game that that can be bought On Steam. Infinite Crisis – DC Heroes battle it out in this battle arena. GameOgre currently has a giveaway for it. Heroes of Newerth – HoN is one of the second or third tier in terms of player bases.